IBJ's Forty Under 40 program recognizes central Indiana people who have become leaders in their fields. They help run major corporations and leading arts organizations. They're bankers, philanthropists and trailblazers. They come from diverse backgrounds but share a passion for making a difference. 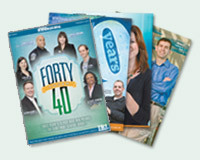 Check out an online version of IBJ's special Forty Under 40 supplement here. Click here for a list of Forty Under 40 IBJ honored in previous years.